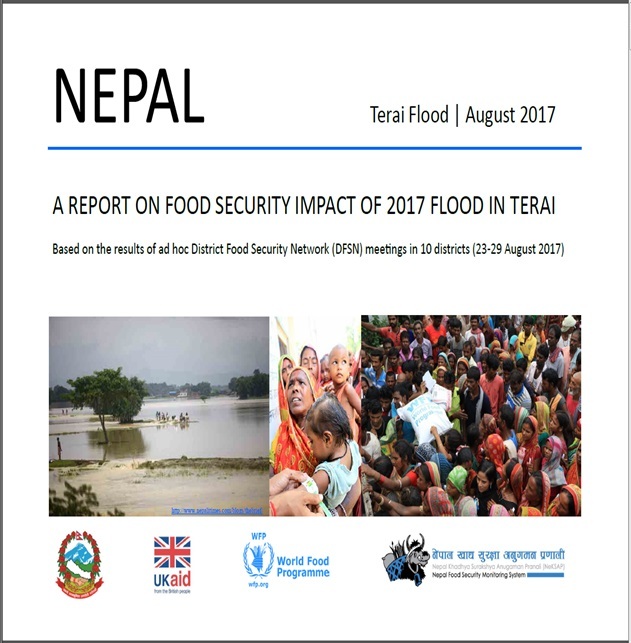 NeKSAP undertook a detailed assessment of the flood impacts on food security through ad hoc DFSN meetings in 10 flood affected districts (Banke, Bardiya, Rautahat, Sarlahi, Mahottari, Dhanusa, Siraha, Saptari, Sunsari, and Morang) during 23-29 August 2017. Based on the post-flood situation, the NeKSAP ad hoc DFSN meetings in 10 Terai districts classified each VDC/municipality as minimally food insecure (Phase 1), moderately food insecure (Phase 2), highly food insecure (Phase 3), or severely food insecure (Phase 4). None of the VDCs/municipalities were classified as a humanitarian emergency (Phase 5) situation. DFSNs estimated that roughly 709,500 people were in Phase 3 and Phase 4 VDCs, and required external assistance to meet food and non-food needs. This is about 42 percent of the total population in the flood-affected areas and 10 percent of the total district population.